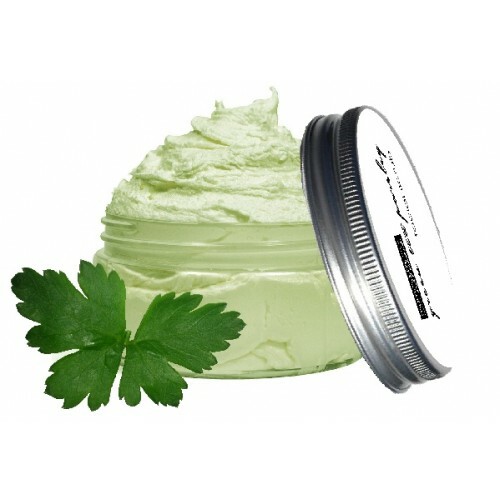 Green Tea Parsley Face Wash for aging skin. NO PARABENS, PHTHALATES, SULFATES, PEGS, SILICONES, ARTIFICIAL COLORS, BISMUTH OXYCHLORIDE, BORON NITRIDE, SYNTHETICS OR TALC. NEVER TESTED ON ANIMALS. VEGAN OPTIONAL. Mild PH of 5.5. Ingredients: Distilled Water, Sodium Cocoyl Isethionate (coconut oil derived), Vegetable Glycerin, Cocamidopropyl Betaine (coconut oil derived), Cetyl Alcohol, Green Tea Extract, Parsley, Carrot Seed Oil, Frankincense Oil, Eco Natural Broad Spectrum Preservative (Benzyl Alcohol, Salicylic Acid, Glycerin, and Sorbic Acid). Green Tea Extract is a rich source of anti-oxidants such as Vitamin C and Vitamin E. Green Tea Extract is hailed in the natural skin care industry. It is said to help repair the effects of aging and environmental factors. The active constituents in Green Tea are the Catechin - Polyphenols. Green Tea catechins are potent antioxidants. Parsley contains immune-enhancing Vitamins (C and A) and is a powerful antioxidant. In fact, many spas use parsley for skin treatments because Vitamin C not only nourishes the skin, it reduces scars and blemishes and stimulates the production of collagen, which is the key to cell reproduction and repair. Carrot Oil is considered to be one of the best oils to rejuvenate and regenerate skin tissues. It helps to remove toxic build-up in the skin, improving the skin's complexion. It can be used to soothe burns, blisters and scars; and is considered suitable for all skin types, especially dry and mature aging skin. Frankincense is considered a valuable ingredient having remarkable anti-aging, rejuvenating and healing properties.